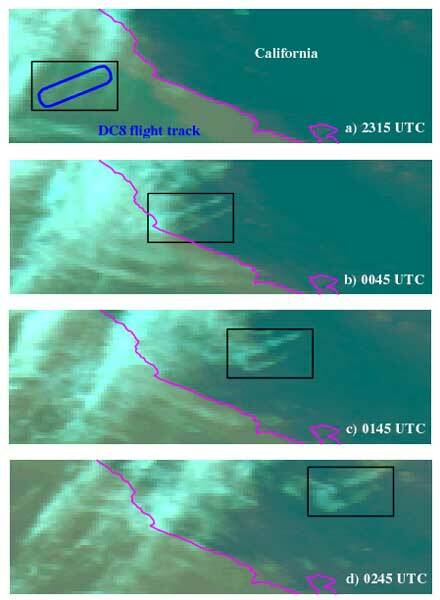 Figure 3-13: Time series of GOES-8 satellite images showing the evolution of a contrail from an initial oval shape to extensive cirrus clouds (from Minnis et al., 1998a). The NASA DC-8 flew an oval flight pattern several times off the coast of California on 12 May 1996 (a), resulting in a visible contrail 15 minutes later (b). This contrail spread as it was advected over California (c), until it no longer resembled its initial shape 3 hours later (d). Satellite photographs courtesy of L. Nguyen of AS&M, Inc., Hampton, VA, USA.